Curiosity gets the better of Curtis Marsh who lines up for a sauvignon blanc tasting, with surprising results. How would you like to try no less than 50 sauvignon blanc’s before lunch? It was a daunting prospect, even for a hardened wine professional. Personally, I am not endeared to sauvignon blanc, although I do enjoy the occasional racy, flinty sancerre blanc from the Loire Valley. Putting aside the notion of a monotonous succession of nostril-twitching grassy, herbaceous bouquets and gum nagging acidity, the opportunity to taste so many examples of this variety from all over the world got the better of my curiosity. Taking advantage of the presence of international wine journalists that were at VieVinum, Paulson assembled a tasting jury comprising 53 wine journalists from 27 countries, assuring the results would attract widespread attention. Indeed, it looked like a meeting of the United Nations, myself flanked by Spain and Russia. The tasting took place at one of the best addresses in Vienna, the grandly belle epoque Hotel Bristol, with all of us seated at one enormous table, adding ebullience to the proceedings. The wines were served in vintage sequence, youngest to oldest, spanning 2005 through to 2000, although with a predominance of 2005. To eliminate any inequities, disputes over tasting order, peeking, bottle or capsule recognition, stringent measures were taken: each wine was allotted a number and transferred to an anonymous glass decanter, the wine numbers then drawn out of a hat in brackets of five and poured in front of us. The wines were scored using the 100-point Robert Parker system, a conversion of the 20-point English-based system, ostensibly more accurate. While I loathe any type of scoring for wine, an erroneous and exploited idiosyncrasy of wine consumerism, it is a necessary evil for this sort of exercise. Among the 50 wines tasted, 18 were from Austria, which could be interpreted as a tad imbalanced; however, it was Austria challenging the rest of the sauvignon blanc world, so a home-team preponderance could be excused. A strong New Zealand contingent was obligatory, being the most recognized adversary, with familiar names such as Cloudy Bay, Palliser, Dog Point and Saint Clair. France was also well represented by Loire Valley producers Baron de “L,” Comte Lafond and Henri Bourgeois from Sancerre and the dynamic Didier Dagueneau from Pouilly Fume, as well as a battery of Bordeaux blanc including Domaine de Chevalier, Chateau Margaux and Chateau Smith Haut Lafitte. I would suggest that while all the French wines were from the expensive end of town, a more humble exposition of producers from Sancerre, Menetou-Salon, St Bris or Touraine might have fielded a better result. There were also some big names from Italy: Antinori, Angelo Gaja, Jermann and Alois Lageder, although none of these producers would hang their hat on sauvignon blanc. South Africa fielded five wines including top producer Vergelegn, but the United States, Chile and Australia were all poorly represented, totally disproportionate to their proficiency and volume of sauvignon blanc production. The US afforded just one wine, a tired 2002 Robert Mondavi Fume Blanc, likewise Chile, with its token gesture from the industrial-sized winery Veramonte. While the 2005 De Bortoli Yarra Valley Sauvignon Blanc did Australia proud, a total of two wines from a country that parallels New Zealand’s pre-eminence in this arena was most disappointing. Where were Gembrook Hills, Leeuwin Estate, Cullen’s, Jeffrey Grosset and the most glaring omission, the iconic Shaw and Smith from the Adelaide Hills, Australia’s stronghold of this variety? Sauvignon blanc aficionado’s (what a dreary disposition) may be quick to point out that some of these wines contain proportions of semillon; well so do Domaine de Chevalier and Chateau Smith Haut Lafitte. Despite these bones of contention, the tasting was professionally executed and a most enjoyable and stimulating experience, albeit demanding. And the winner is Austria! Yes, I can hear you yawning, a predictable home victory; to the contrary, none of the wine press I conversed with thought that Austria would come out on top and neither did I. First place with the panel’s averaged scores at 94.1 points went to Burgenland vintner Andi Kollwentz 04. Two New Zealand wines followed, Palliser Estate 05 (93.9) and Saint Clair Block 3 05 (93.2). Fourth place was Henri Bourgeois Pouilly Fume La Demoiselle 04 (93) and fifth, another Austrian, Andres Tscheppe from Styria (92.9). Dog Point and Cloudy Bay were line-ball for 6th and 7th place. 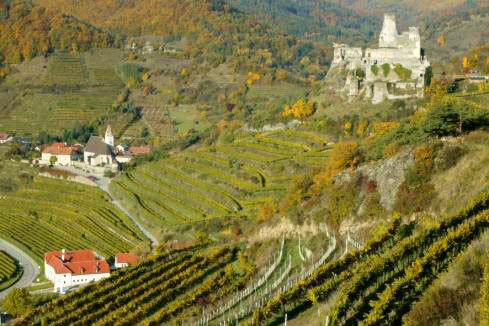 Out of the top 10 current vintage wines, five came from Austria. Out of the mature vintages, Neumeister winery from Styria pipped Smith Haut Lafitte from Bordeaux for first place, with the next five wines all coming from Styria. Ironically, my ratings for the top 10 wines were at total odds with the panel result. Indeed, my tasting note for the winning wine reads “sweetish nose, cat’s pee, grassy, asparagus, palate pineapply sweet and cloying – botrytis? Looks more like chenin blanc? (80 points).” Likewise I was equally harsh on the New Zealand wines, particularly Marlborough as I am not a fan of the tropical fruit bomb style. My comments should not be construed as gratuitous, rather they highlight the fact that one person’s wine is another’s poison. And, wouldn’t it be droll if we all liked the same wines. Furthermore, I had the opportunity to retaste all the current vintage Austrian wines in the tasting at VieVinum and remain unchanged in my opinions and ratings. For the record, my top scoring three wines were also Austrian. The Weingut Nigl 05 from Krems was my clear winner. A stunning wine, my notes read, “nicely perfumed, ripe pears, fresh figs, grapefruit, citrusy palate, racy, powerful with bite of lemon acidity and incredible length (94).” Discussing this with the winemaker, he confirmed that this wine had seven grams per litre of natural acidity: most impressive and indicative of the outstanding 2005 vintage www.weingutnigl.at. Second place went to Lachner- Tinnacher 05 from Steinbach (93), incidentally placed 10th by the panel with an almost identical score of 92.5 www.tinnacher.at. Third place went to Sattlerhof 05 from Gamlitz (91), also a respectable 11th panel place with 92.5 points www.sattlerhof.at. This type of tasting exercise, while topical and held in the spirit of healthy competition, is not conclusive. However, it unequivocally demonstrated that Austria is a force to be reckoned with when it comes to white wines, adding sauvignon blanc to its already formidable line-up of gruner veltliner and riesling.